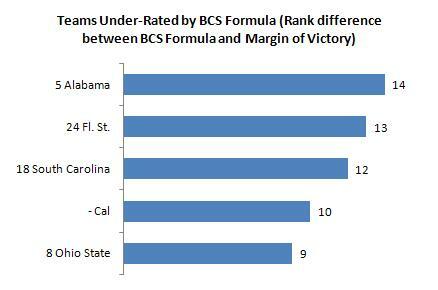 I’ve previously posted about the perils of computer polls in College Football’s BCS system. 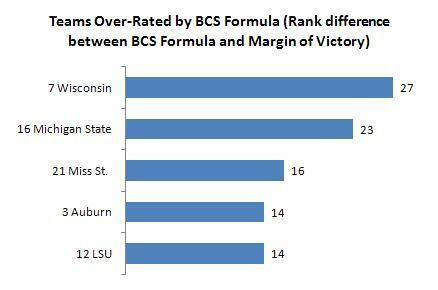 But the computer algorithms that the BCS has banned can give us tremendous insight into who is under-rated and who is over-rated. If you remember last time, I called out Oregon State and Michigan State as two teams that were vastly over-rated when margin of victory is removed from computer polls. Since then, both have lost and dropped precipitously (Oregon State is no longer in the top 25 of the AP). Look out Big Ten and SEC. It appears that both conferences have teams that are vastly over-rated. If the “real” computer polls are any indication, these teams could be in trouble in coming weeks. It’s not surprising to see preseason favorites Alabama and Ohio State on this list, who have played well for the season but each lost once so far. However, it is surprising to see the inconsistent Cal, South Carolina, and Florida State on this list. When these teams show up to play, they dominate. But they have frequently not shown up. The upset-watch is on for the BCS top-5. Which games should you pay extra attention to? 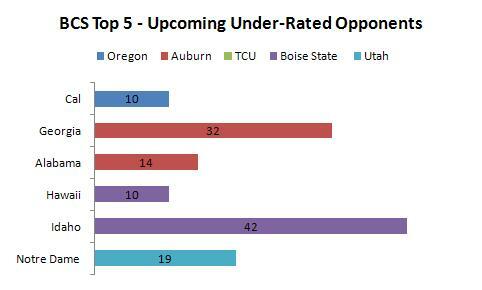 The Utah-TCU game will eliminate one team this weekend, and all the remaining teams face an under-rated opponent. I will particularly be watching Boise State. They face former top-25 team Nevada, plus 2 under-rated teams including Idaho, who they will play on green turf.